Josh moved to Nashville from LA to find his voice in country music; Krista moved from Boston because she wanted a chance to pursue her own music instead of covers; Todd moved to Nashville because he and his wife wanted to open their own church. 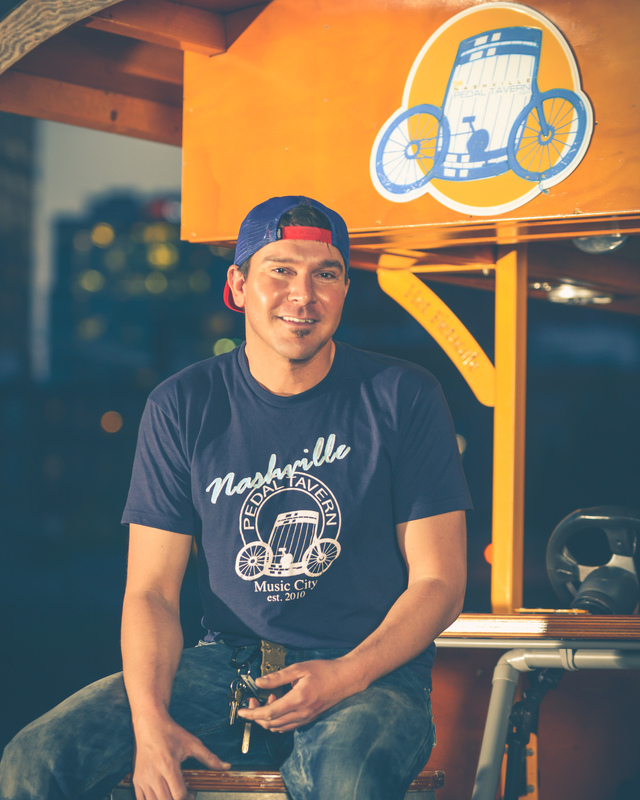 While they come from different places with different goals, they have one thing in common: the Nashville Pedal Tavern. Josh, Krista and Todd spend their weekends driving giant bikes full of (mostly drunk and mostly out-of-town) riders around the city — and they have a great time doing it. The idea is simple: a group of friends reserves a pedal tavern (or two), brings whatever drinks they want and are steered around the city to select bars for which they have been given discount bracelets for drinks. After two hours of biking and bar hopping, they are dropped off downtown and have until 10 p.m. to make the most of their bar discounts. What makes the operation run so smoothly, though, is the drivers — the people who sit in the middle, steering, breaking, not drinking, and waiting outside bars for the riders to return and continue their journey. These people are tour guides, pointing out interesting locations and facts about the city; DJs, keeping the music upbeat and sing-along-friendly; comedians, keeping the bike cheery; and sometimes babysitters, keeping everyone on and off the bike safe, respectful and out of trouble. 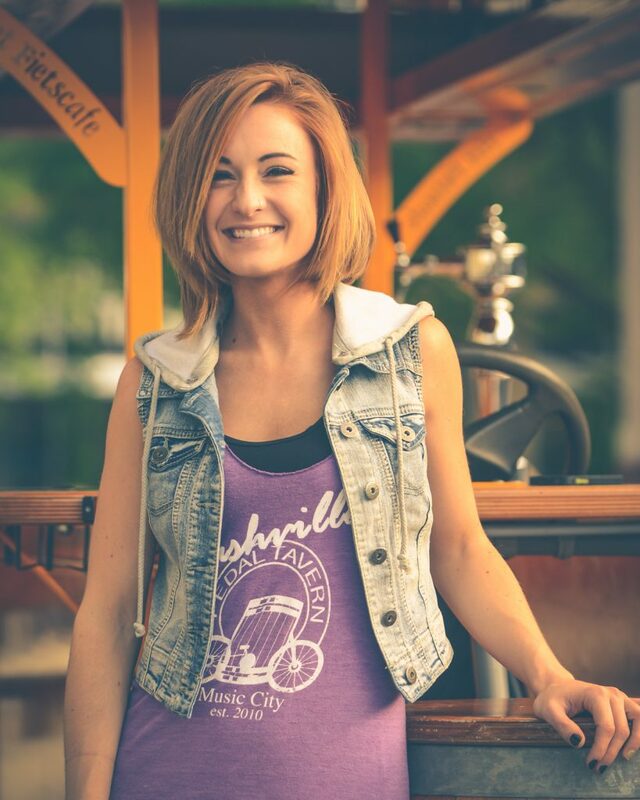 Krista Angelucci has been a Pedal Tavern driver for a little over a year. When an audition for a girl group created by Mercury Records fell through and she was tired of touring New England, Krista found her voice in country music and began traveling back and forth between Boston — where she sang at Celtics and Pats games — and Nashville. 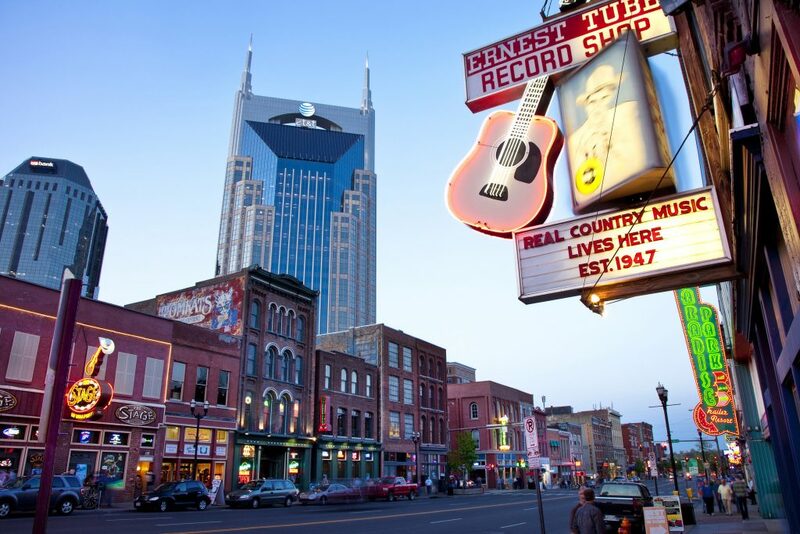 A year after releasing her first EP, Krista packed up and moved to Nashville. She soon found the Pedal Tavern and was able to cut three jobs to one, and spend more time each week on her music. “Mondays through Wednesdays are my music days, then Thursday through Sunday I work at the Pedal Tavern. I’ll do maybe two rides in a day, probably up to four in one week. That’s usually during the day, then at night I either go play or go see my friends play,” said Krista. Even though Krista came to Nashville for her music, when she’s at work, her attention is on her bike guests. If you’re lucky, Krista will combine her two jobs and sing for her riders. “It’s a lot of multi-tasking: driving, babysitting and reading people to make sure they have a good time,” she says. As much as she wants her music career to take off, Krista hopes she can always be a part of the Pedal Tavern. Check out her upcoming shows on Kristaangelucci.com. Part-time driver, part-time … pastor? As the newest member of the team, Todd Griggs found himself driving a Pedal Tavern to support his family while his church grows. He and his wife, Mica, had been planning a big move to open their church, and after narrowing their list of U.S. cities down, they visited Nashville and knew that was it. Todd knows that Nashville is full of talent, but because of that, it’s hard for artists to get platform time. Last month, his church, Rocktown, hosted a new summer concert series for local artists. Not only have the company and employees opened their arms to Todd and his family, but they are also extraordinarily supportive of his endeavors. Fellow driver Krista played at the first concert, and Josh (whose story is below) played at the July 19 show. Other singers will join the ranks August 23. Nashville Pedal Tavern even hosted the event, allowing guests free food, drinks and no cover. “We’re meant to love people, not judge people,” says Todd. That’s how he runs his church — and his Pedal Tavern. The longest standing member of the Pedal Tavern family is Josh Cloud. He was the first hire under Angie and Brian, the Pedal Tavern owners who took over in 2013, and he doesn’t plan on going anywhere any time soon. Josh has had riders from all across the U.S. and Canada, from bachelorettes to “Dirty Thirty” birthday parties to senior citizen outings. In all his time as a driver, he’s collected some pretty great stories. Clarkson is just one of many celebrities Josh has had on his bike. From Duck Dynasty to Party Down South, Love and Theft and Lady Antebellum, the stars like to get in on the Pedal Tavern action. Josh was even a part of the taping for CMA Fest with Big and Rich. Like many people who call Nashville home, Josh isn’t from here. 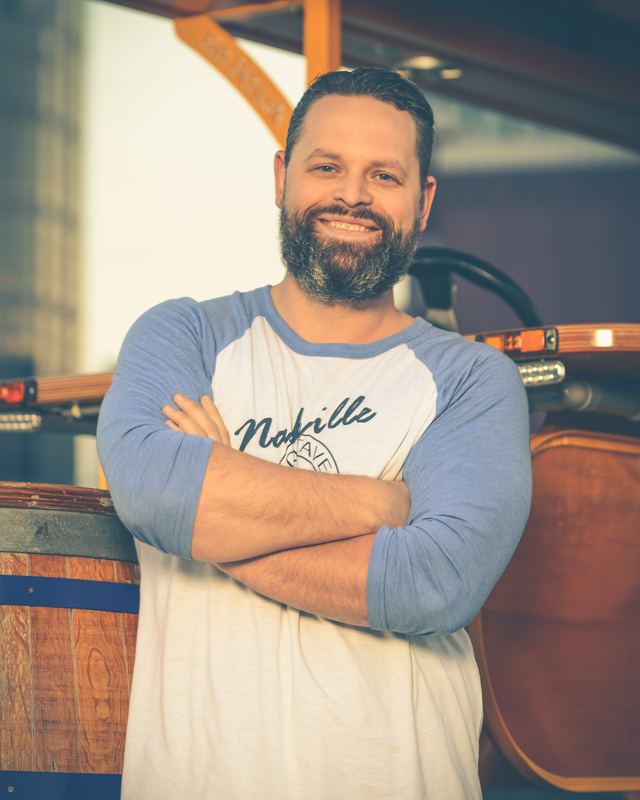 Born and raised in Southern California, Josh came to Music City after college to pursue his musical dreams. 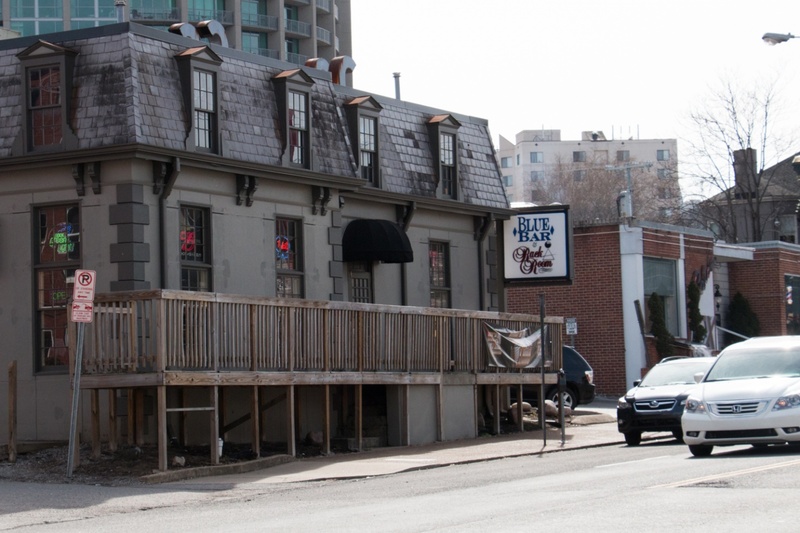 He had a regular gig at the Tin Roof, but was forced to quit in 2009 per the rules that state all contestants have to quit regular performing gigs and jobs when they make it to Hollywood Week on American Idol. And then his band dispersed; His drummer is currently on tour with Taylor Swift and other band mates have toured with Luke Bryan and Lady Antebellum. Josh is still pursuing his singing dream, and having some success, but he has one concern in the back of his mind about stardom. Josh, also, is happy to sing for his guests if they ask. For Josh, dedication to this job is easy because he loves what he does — and the city where he gets to do it. You can run into these drivers all over the city, but each has a hot spot where they love to be when they’re away from their bikes. Cafe Blue in Blue Bar! I love it there. Kimber runs the coffee shop and she is one of the sweetest people I know. They have these amazing cookies and it’s a great spot for lunch. 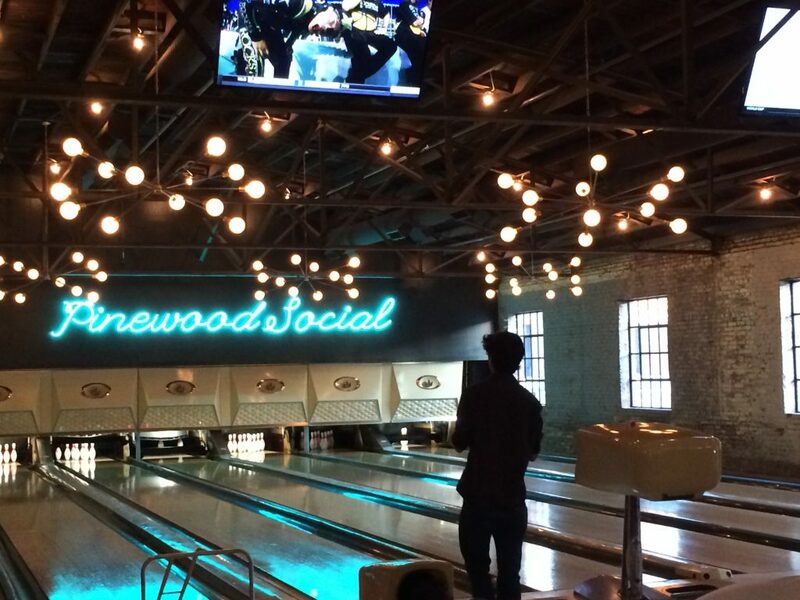 Pinewood Social is a great place to work, meet friends for meetings or just relax on their patio. They have great food and coffee and it’s a great environment to get creative. Anywhere downtown. Seeing all the people all day — even at 10 a.m. — listening to live music everywhere makes me happy. 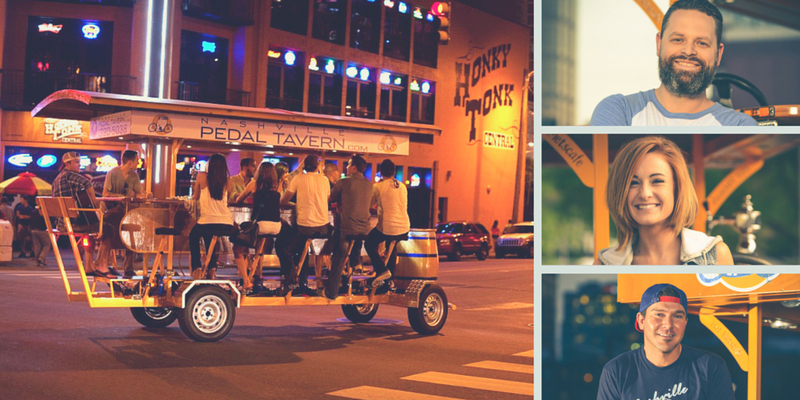 To learn more about the Pedal Tavern — or to book a ride — visit their website. TODD: I took a bike to the riverfront once and it was full of probably 100 cheerleaders all under the age of 15. All of a sudden, my riders and the cheerleaders all broke out into a random dance of the Cupid Shuffle. JOSH: A bachelorette party from San Diego. They were all dressed up like Disney Princesses and it happened to be the same weekend that Frozen came to town, so there were little girls all over the city in blue Elsa dresses. They were all pointing with their mouths hanging open as the princesses rode by. We stopped and the bachelorette party would get off the bike and take pictures with the little girls. It was crazy. Playing DJ, our drivers admitted, is one of the toughest aspects of being a Pedal Tavern driver. But after years of experience, Josh has a few hits he can bet on.